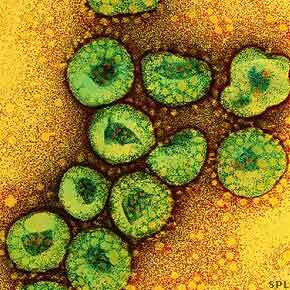 A man from Qatar has been confirmed as the latest patient sickened by a new strain of coronavirus, causing the World Health Organization (WHO) to raise the alert for increased biosurveillance of the SARS-related virus. Health officials are investigating whether the novel virus may have spread between humans after close contact in Saudi Arabia, the origin of several other cases, including two deaths. The total of laboratory confirmed cases to date are 6, with several suspected cases pending. “Until more information is available, it is prudent to consider that the virus is likely more widely distributed than just the two countries which have identified cases,” says the WHO statement. WHO is encouraging increased vigilance in surveillance for severe acute respiratory infections and testing of patients with unexplained pneumonias for the new coronavirus even in the absence of travel or other associations with the two affected countries. The organization additionally advises any clusters of such respiratory infections in health care workers should be thoroughly investigated regardless of where in the world they occur. Previously, WHO had only advised testing patients who had been to either Qatar or Saudi Arabia — the two countries with all six reported cases. Germany’s Robert Koch Institute said Friday that the Qatari patient fell ill in October with severe respiratory problems. He was brought to Germany for treatment in a specialty clinic, recovered after a month and was released this week. Experts aren’t sure how the virus is spreading but suspect it may be jumping directly to humans from animals like bats, camels or goats. In the latest case from Qatar, however, the patient had no known links to animals. In 2003 approximately 8,500 people worldwide were affected by SARS, or Severe Acute Respiratory Syndrome, resulting in about 900 deaths.